For our third and final installment in the Darien Gap miniseries, I present the video edition. Maybe this will give you a little bit of a feel for what our voyage was like, although I guarantee there was more sea sickness than is shown in the video. Enjoy! We never entertained the formidable challenge of crossing the Darien Gap overland so we had three options to get to Colombia. The Darien Gap, “the world’s worst roadblock”, is sixty-six miles of untamed jungle isolating South America from Panama. Despite the continuous landmass that forms the American continents, only the brave and the foolish can cross it entirely by land and without the help of boats or planes. The cause was unclear, but no sooner had we bounced over the tope fifty yards back than I felt the unmistakable sad slushy wobble of a deflated rear tire. An old man watched us blankly from behind a tumbling pile of scrap wood across the street. He didn’t strike me as hostile but there was nothing notably friendly about his behavior. 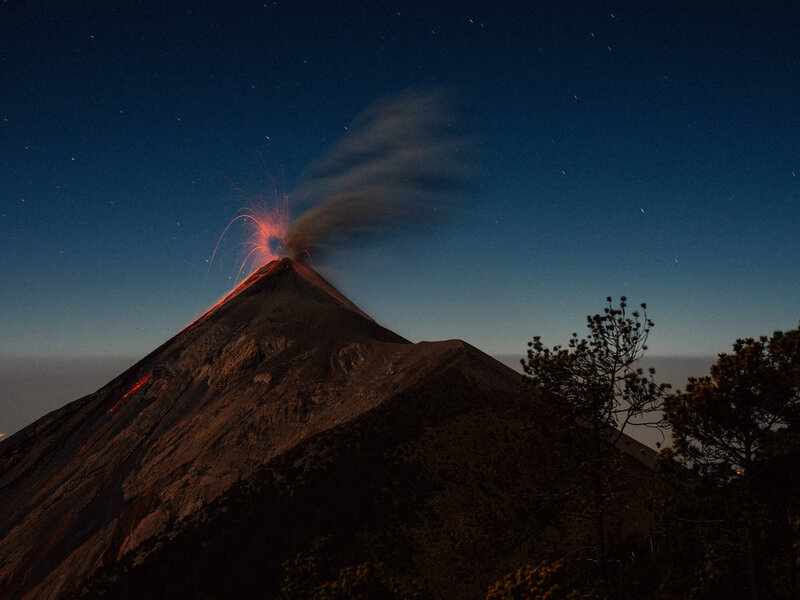 I wonder what it must be like to have grown up with volcanoes nearly always within sight; what force they exert on the imagination. Perhaps I can only speak for myself of the force they exert on mine—to make my daily trips to the market, to think, to be thoughtless, in the shadows of volcanoes. It wasn’t the first time that we have had bike problems—in fact, these setbacks have become somewhat endemic of our trip—but before now we had ample time to adjust our itinerary. As we approach Panama and our sail to Colombia, however, our time is becoming much more precious. There is no shortcut. There is no finely paved toll-road. There is no circumventing the time-intensive border crossings. We had to confront the fact that we were not visiting the ancient city of Tikal and we were not swimming in the natural jade-colored pools of Semuc Champey, we were headed to the clogged streets of Guatemala City. 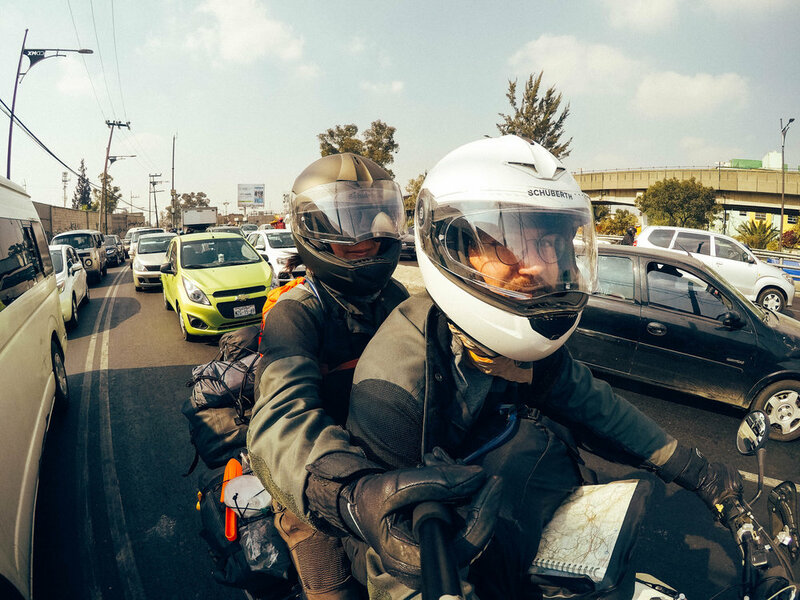 Watch our video chronicling our journey across Mexico from Baja to Chiapas. What I want to share often seems so much bigger than my own particular slant, and behind my desire to relate experience in a way that seems authentic and immersive is the bare hope that someone is listening. For we all want to be heard. Rarely, though, do we know the peace of telling a worthy story without some grappling, without visions of pulling a dazzling fish out of the blind seas with only one’s hands. I have a recurring feeling of a trip just beginning. All the evidence to the contrary, the worn out tread on the rear tire, my slowly improving Spanish, the constant clicking of the odometer clock (recently surpassing the 50,000 milestone), my beard grown out, the wild coconuts, bananas, and coffee beans that burst jubilantly from the brush all around us, is unconvincing. There are as many routes as there are people to take them. Looking back on our time in Mexico I easily become distracted by the places we did not visit. Sunday evening, as the sun cast long shadows over the deep valleys of Chiapas, we arrived in San Cristobal de las Casas. We had expected to stop short of the city in a dirty hotel in a nameless mountain pueblo, but the roads were smoother than we expected and straighter and we made good time. We began our day on the beach and ended it at 7,200 feet. Our route was intentionally planned out very crudely. We took out a paper map of Mexico and literally drew a line across it along some roads that looked interesting, making sure to pass through the cities we wanted to visit. Of these there were only a couple at the start: San Miguel de Allende where Diana’s family lives and Mexico City, where I visited last Summer, but due to a surprise visit from the ghost of Montezuma, was unable to explore the pre-Aztec Teotihuacan city ruins just outside the city. Soon, by research in Lonely Planet (still a useful guide in spite of the internet) and word of mouth we added to our short list Guadalajara, Oaxaca City, the ruins of Campeche, Morelia and a handful of others. We estimated that we could ride 200-250 miles a day and planned our stops accordingly. We have since decided that we prefer to plan fewer miles and give ourselves more time to stop to eat, take selfies, and explore while still allowing enough time to arrive at our destination before dark. Sometimes it doesn’t quite work out as planned. Between Nayarit and San Miguel de Allende, we ate only gas station peanuts and Snickers bars for lunch, so pressed were we for time. The weather has been amazing in these winter months, dry air and moderate temperatures, but the short days have limited our riding considerably. We decided from the beginning not to ride at night. Everyone we have spoken to has agreed with that decision. The bandits come out at night, as do the cows, goats and sheep, and the potholes don’t go anywhere. Though there are highways that are safe and secure, even on those my enjoyment decreases rapidly with the setting sun. I hope you’ll forgive the certified food-handler’s geek in me as I recount how swiftly and efficiently one pork-kebab stand in Coyoacan met the demands of their immense nightly crowd, and how each crew member handled raw meat, cooked food, sliced fruit, and cash payments. Without even a bottle of hand-sanitizer in sight. Did I partake of the kebabs? Sure did. Was I conflicted? You bet. What exactly are we doing out here? I’ve seen probably a dozen cathedrals now and town squares and ocean front promenades. All of them unique, many beautiful, some decrepit. We’ve weaved through hairpin turns in the mountains on the way to missions and villages, bounced over topes and washboard dirt roads, swerved around potholes and semi trucks. Crossed hundreds of bridges and tunnels. We’ve eaten many tacos from the largest al pastor spits you can imagine. We’ve seen the landscape change again and again, wet to dry to wet to dry, mountains to flatlands to mountains. Nathan and the friends we’ve met on our journey have wanted to know how I spend all that time alone with the thoughts bouncing around in my helmet. In truth, I only get bored when we’re riding on toll roads, and I mostly love our connection to the environment as we ride. Without the shelter and security of an enclosed vehicle, we are especially vulnerable, but I find that within that vulnerability, we have a unique opportunity to exercise mindfulness. On a motorcycle you are free. Free to leave when you want. Free to go where you want. Free of time tables. Free of luggage bins. Free of pat-downs. Free of crowds. Free even, at times, of roads. But you aren’t free of your motorcycle and you aren’t free of yourself. These two remain. They aren't neat and tide like a time table and they aren't as definitive as a boarding pass. They respond to questions with more questions and demand a great deal of faith. You can't be certain how far you can go because you and your bike have never gone there. Lacking answers, you listen with all your senses and try to feel what your bike feels. You rub the oil in your fingers, you put your ear to the cylinder, you place your hand on the tire. You try to read the signs. You try to read yourself. This is your timetable though the lines are faint. We crossed in Tecate, were baptized in sand at Campo Papa Fernandez, pushed our off-road limits at the gap in Highway 5, broke down and were redeemed at Bahia Concepcion, rode the waves at Los Cerritos, and bid farewell at La Paz. In total, we spent a month on the Baja California peninsula. We experienced a wealth of desert and coastal beauty. Some great roads and some bad ones. We chose to avoid most of the most popular destinations, forgoing Tijuana, Rosarito for the more remote route South along uncompleted Highway 5 and skipped Cabo San Lucas in search of less adulterated sands. I forget distance out here in the desert. Phone reception can disappear completely between towns. A single paved highway connects a spiderweb of sand roads connecting innumerable pueblas. Many don’t appear on maps. But there are people and houses and minimarkets nonetheless. I forget that the distance we’ve traveled from town to wilderness would not even have taken us from San Francisco to Sacramento. Each turn creates new worlds from nothingness, erasing my sense of space. Out here among the cacti and sunbleached bovine bones, it feels we have traversed centuries.